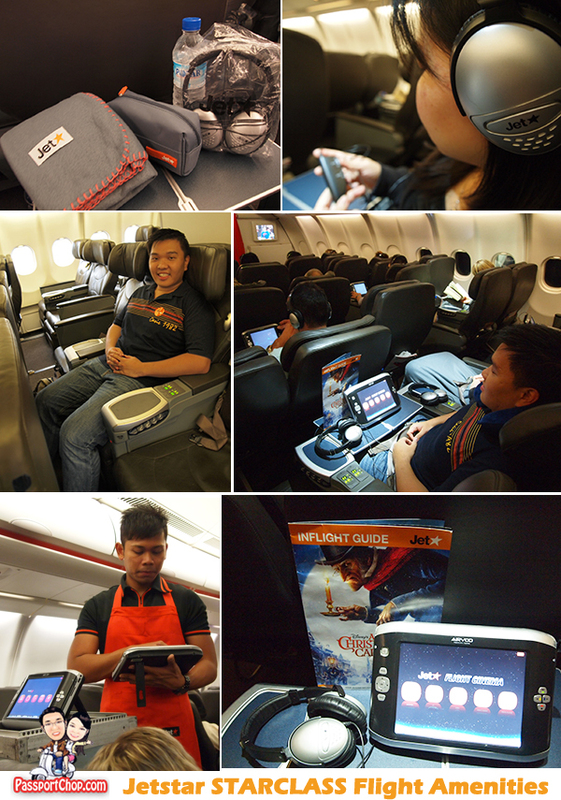 Thanks to Jetstar, we had the opportunity to enjoy the Starclass experience onboard Jetstar’s inaugural flight from Singapore to Melbourne. The launch of this new Jetstar long-haul value-based flight was held with much fanfare and received wide media coverage as Mr David Hall, Jetstar CEO of Australia & New Zealand, arrived in the first flight, JQ7 from Melbourne onboard the new Airbus A330-200 plane. Jetstar Asia’s CEO Ms. Chong Phit Lian, senior officials from the Changi Airport Group and the Australian High Commissioner to Singapore, Mr. Doug Chester were among the huge party to welcome Mr Hall. This media event also provided a preview of what this new plane had to offer through an aircraft tour – there are in total 303 all-leather seats with generous seat pitch – 38 seats in StarClass (38 inches pitch and 19.5 inches in width) and 265 seats in economy (31 inches pitch and 17.5 inches in width). Unlike other low-cost airlines, Jetstar’s A330 fleet offers a two-class long haul product including Jetstar’s international business class product called StarClass. Jetsaver Light one way fares between Singapore and Melbourne start from S$428 and StarClass one way all inclusive fares start from S$898, providing for a very competitive advantage price-wise compared to other airlines plying the same Singapore – Melbourne route. After the Jetstar A330-200 aircraft tour, we couldn’t resist the photo shoot opportunity with both Jetstar CEOs who made this Melbourne-Singapore long haul value-based Jetstar route possible. Jetstar International Business Class-equivalent – StarClass has been designed for passengers seeking additional space and comfort in-flight and a more specialised service offering. StarClass passengers have complimentary access to Qantas Club lounges where available. 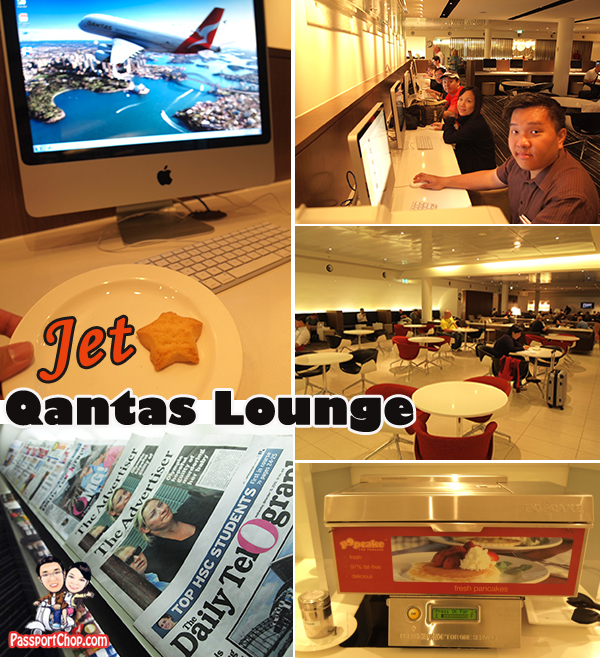 The Qantas lounges in Singapore and Melbourne are huge and can accommodate hundreds of travellers. Check your emails, facebook, twitter before you board, with free in-lounge Wi-Fi and if you don’t have a laptop, there are business terminals e.g. big screen Mac computers which you can use for your Internet surfing needs. Hungry? Enjoy complimentary warm local fares e.g. mee soto, in the Singapore Qantas lounge and you can even make your own pancakes with the pancake machine in the Melbourne lounge! Lounge access is just one of many pre-boarding perks enjoyed by Starclass passengers. We also enjoyed priority flight check-in with a dedicated Starclass lane, avoiding long queues. Starclass privileges include priority boarding, allowing us to settle down quickly, refreshed and good to go for the 7-hour flight to Melbourne. 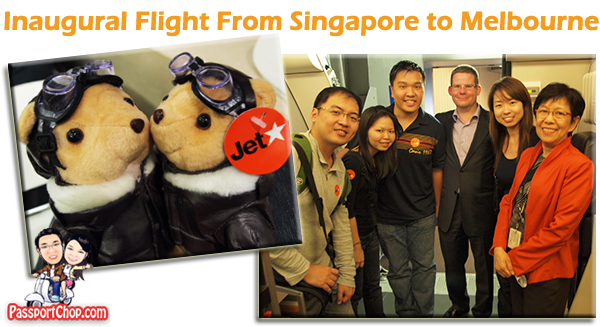 The perks did not end there as we found a pleasant surprise at our seats – complimentary Jetstar comfort packs! The comfort pack is well-stocked with a pair of flight socks, eyeshades, ear plugs, inflatable neck pillow, toothbrush and toothpaste and even small tube of rejuvenating face cream moisturizer and lip balm! The small cloth pack itself will also come in handy for our own travel toiletries! It also comes with blanket, a bottle of water and noise-cancelling headphones. The headphones came with its own AA battery and was quite effective in sifting out background noise – when coupled with the other amenities e.g. blankets, eyeshades, it allowed us to sleep comfortably onboard this overnight flight to Melbourne. After the inflight meal service, we were offered a Video on Demand Unit. Each unit is programmed with a range of movies, TV programs, music videos and children’s programs. This complements the range of audio programs easily accessible by plugging your headsets into your seat. These units support themselves with a tripod at the back – they are not touchscreen-based but are user-friendly enough to operate without requiring further instructions. Check out this video below to see how easy it is to use it (i was watching the Legend of the Guardians: The Owls of Ga’Hoole – a great movie!). These Video on Demand Units are also available for Economy class passengers to hire at only AUD15 (for long haul international flights). As StarClass passengers, we were also treated to an unlimited beverage and snack bar, as well as all inflight meals, included as part of the StarClass personalised service. For each meal, we were able to select from three meal choices, one of which will be vegetarian and there were 2 meal services for our 7-hour long flight i.e. dinner and breakfast for the overnight flight to Melbourne; lunch and light afternoon tea meal for the flight back to Singapore. We also enjoyed a wide selection of beverages which included water, juices, soft drinks, tea, coffee and a range of alcoholic drinks. 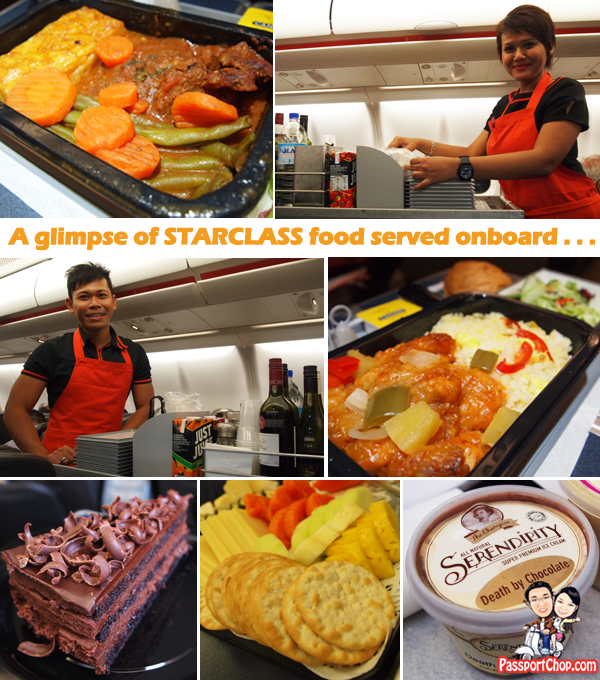 My Starclass experience with Jetstar’s inflight food and beverages is positively overwhelming! 🙂 Within minutes of boarding the plane, we were offered a bottle of Chardonnay champagne and the meal service started right after takeoff with warm meals and beverages. After a round of meals is served, the friendly cabin crew began pushing around a trolley of desserts where you can choose from chocolate cake slices, cheese and crackers platter, cut fruits or even all three together! This was followed up with cabin crew bringing around a basket of even more goodies i.e. Ferrero Rochers, nuts and cookies. We were kept busy for about 1-2 hours managing this deluge of yummy food – this routine was repeated for the second meal service; suffice to say, of the 7-hour flight from Singapore to Melbourne, we spent almost half of it on the inflight meals! Despite arriving at 7am in Melbourne (4am Singapore time), we felt refreshed and excited to explore the city, thanks to the comfortable Jetstar Starclass experience and the yummy omelette breakfast we just had onboard. We were met at the airport by Jetstar Social Media manager, Mr Andrew Mathwin (the tallest guy in the picture below :-p) who had worked with Tourism Victoria for our exciting itinerary for the next 2 days. Over the next 2 weeks, stay tuned to PassportChop.com for our trip experiences in Melbourne. WAH so nice. I miss Melbourne! Wish we could have more time there! Hope we can travel again! I just came back from a starclass experience from Japan and it rather disappointing. after changing from the 2nd row the the last row in the starclass area( injured passenger required more leg space), I found beer stains on the chair and on my fold out table, 8 hours of sniffing beer was not that comfortable, not to mention the seat did not recline all the way due to the wall. It didn’t stop there, as i was seated next to the cabin crews personal storage area, throughout the night i was bumped by staff as they bent over to pick up their baggage. Although the flight attendant was nice and friendly, its got to be thumbs down for cabin cleanliness. But can I really expect more from a low budget airline? After arriving in Brisbane for a stop over, I then found myself only having 20kg of baggage available to me as mention on my ticket. (Starclass allowing 30kg) I was then caught having to explain myself on how I booked starclass from japan to melbourne and am entitled to more luggage allowance, I luckily got through without having to pay extra, my friend got slapped with a $30 fee. I must say there is a big difference in attentiveness between the staff on the international flights and the domestic, as I was boarding the plan, I don’t even think the two flight attendants stop to acknowledge my existence, instead taking the tickets from my hand scanning them whilst continuing her conversation with her co-worker. Then I continued to walk past when I was stopped and told I had to much hand luggage. ( I was entitled 2 10kg hand luggage as star class policy) . A good holiday ending with an annoying trip home. sorry to hear about that especially the beer-stained seat (for 8 hours!) – thats just horrible! This is my 1st time to the blog,Amazing post! You’ve made various pretty helpful statements and I appreciate the time you’ve taken within your producing. It’s clear to find out that you simply have an understanding of what you are speaking about. I’m looking onward to studying a lot more of your webpages material. Thank you! It’s is my first time to the site,Great post! You’ve made various very significant statements and I appreciate the time you’ve taken within your composing. It’s simple to see that you simply have an understanding of what you are speaking about. I’m researching onward to learning a lot more of your web sites material. Nice share! Normally I don’t read article on blogs, but I wish to say that this write-up very compelled me to take a look at and do so! Your writing taste has been surprised me. Thanks, very great article. Thats an all around great post! I am flying to Singapore in star class 27/3/12 after reading the revue of the inaugaral flight, I am looking forward to sampling this service. What do you get to keep from the welcome pack?